I've recently started a weekly brunch club with my friend Emma. The first rule of brunch club is, well, actually there are no rules - we just catch up for brunch once a week, and try to pick a place we haven't been before. Too easy! 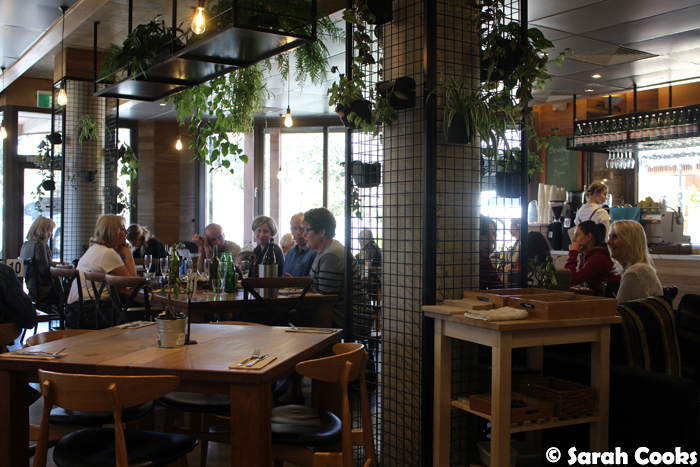 Now, Emma is a serious brunch enthusiast and has well over a dozen places on her "to visit" list across Melbourne, so nailing down the choice for our first brunch club was actually quite tricky! However, while we were Whatsapp'ing, sharing Zomato lists and emailing back and forth to decide, I happened to get an email from Third Chapter in Eltham inviting me for a visit. First brunch club venue decided! Eltham is a little far for Emma and I (east side girl for life! 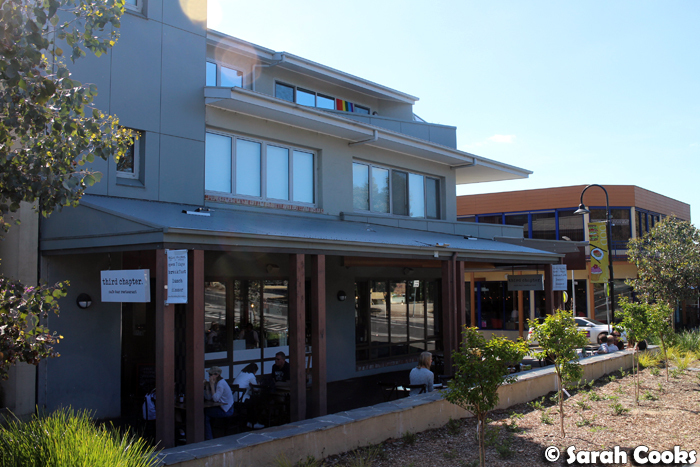 ), but we thought it might be nice to go and check out a suburb that we wouldn't normally visit. Third Chapter is a big, airy venue, and sees to be very popular with young families - we spotted many prams, and high chairs were available. They're open for breakfast, lunch and dinner, with a range of easy pleasing meals on their menu - think things like eggs on toast, a big breakfast or hotcakes for breakfast, or steaks, pastas, risottos or burgers for lunch or dinner. They've also got a cute take-away coffee window opening onto the street. 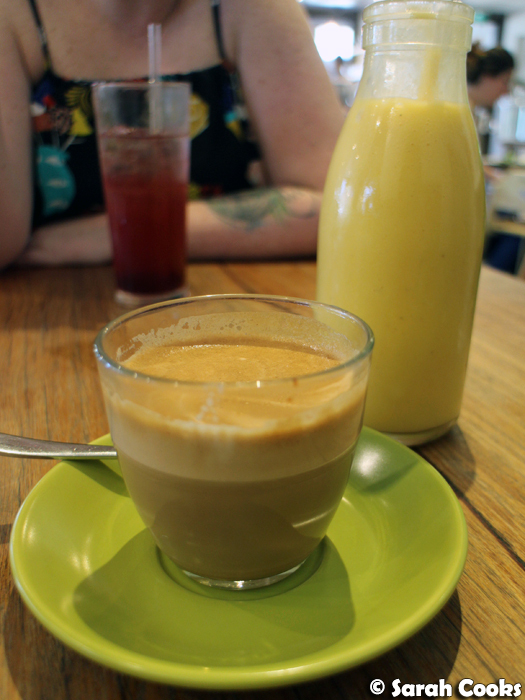 We were really impressed with their drinks selection - a creamy mango and yogurt smoothie (like a lassi) and a magic for me, and a house made cherry lavender lemonade for Emma. My coffee was great, and even more excitingly, they knew what a magic was! (I often find that they're unknown outside of the inner city uber trendy cafes - I usually ask if they can do one, and if they look at me confused, I just get super awkward and ask for a flat white instead). The cherry lavender lemonade was an unusual drink, and Emma really liked it, although she commented that it got very sweet towards the end. 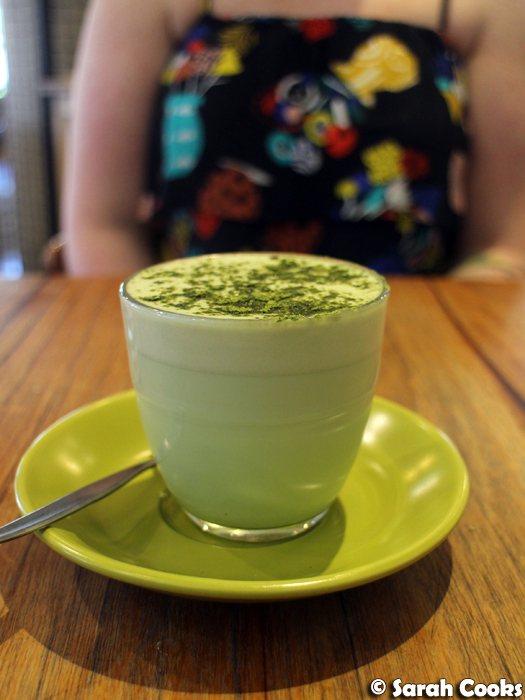 They've also got loads of different trendy lattes - chai, turmeric, matcha etc., - and Emma's matcha was very good, with a nice prominent flavour. Onto the meals! 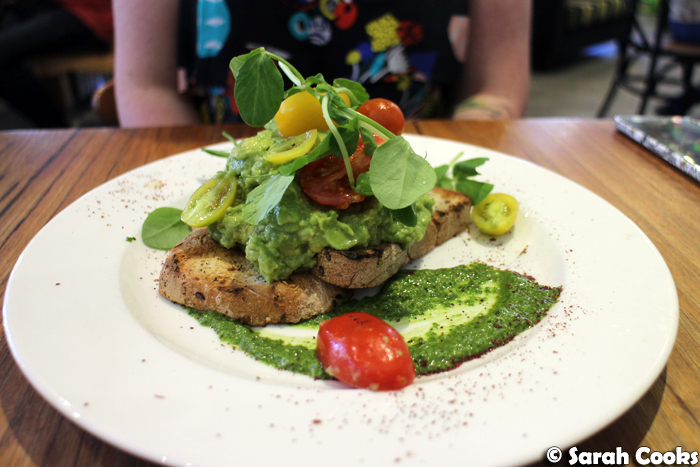 Emma went for the avocado crush, with gluten free toast. It was a nice generous serving, but unfortunately the bread came out cold, and the avocado was a little bland. However, shortly after beginning to eat, we realised that they'd forgotten to bring the Persian fetta. As soon as we asked a friendly waitress about this, a pot of that delicious salty creamy feta was brought out and it really completed the dish. 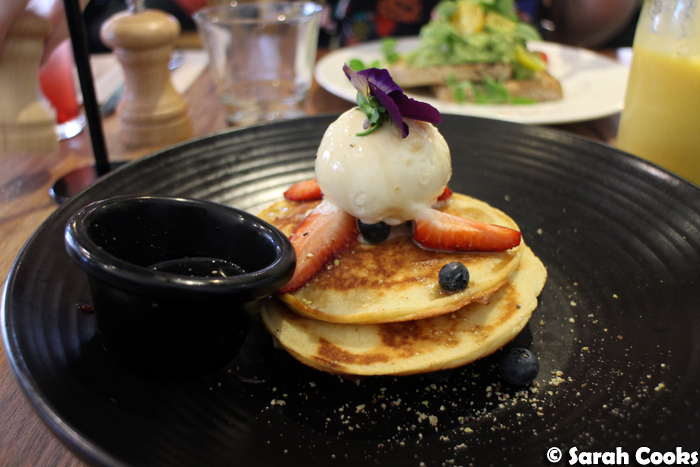 I have been craving sweet brunches lately, and I couldn't go past the buttermilk hotcakes. These looked simple but were very tasty. The hotcakes were warm, light and fluffy, and sat atop a little pile of roast rhubarb. Combined with the berries, maple syrup, ice-cream and crunchy pistachio crumble, it was a winning dish. 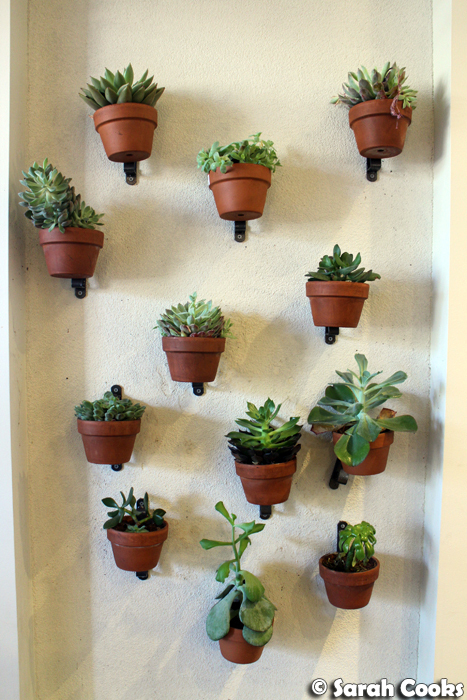 So that was our brunch at Third Chapter! It was an enjoyable meal and a really pleasant spot for catching up and chatting. For me personally, it's a little far for frequent visits, however for those who live close by, Third Chapter would make a great local.